Pattern includes diagrams and helpful assembly photos. Pattern comes as a PDF file. 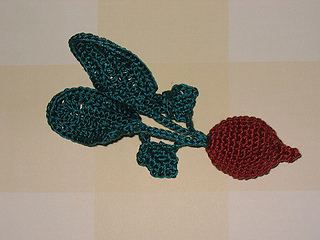 Any gardener or cook will love this darling crocheted radish. It has two types of leaves – the seed leaves from when the seed first sprouts and the true leaves that appear as the radish grows. Fill the sachet with lavender or cotton soaked in your favorite essential oil. Finished Size: Approximately 5” long including leaves. Root body is 3 1/2” around.